Some of my favorite recipes to make and post on The Apron Gal are Asian inspired. Some are more Chinese and others are Thai but a lot of them have similar flavors. And almost all of them work with a basic set of ingredients no matter what you are making. Cooking food from other cultures [even if its usually very Americanized] can still be intimidating and I'm sure many people skip over recipes that seem to complicated or have too many ingredients. I want to show you the base of all my Asian cooking that I have in my home and I rarely am unable to make any Asian dish I want to! Nearly all of these items can be purchased at your local grocery store. Go to the "Asian" section of your store or if you want a new adventure check out a local Latin or Asian market. Typically grocery stores that are "Asian" or "Latin" also have food from many other cultures as they are more of an "international" grocery store. Most of the specialty bottled ingredients will run you $3-5 per bottle. But you will notice these last forever [except soy sauce]. I recommend just gradually building your Asian repertoire by picking up one item each time you grocery shop. Before you know it you will have everything you need! 1. Sesame Seed Oil. This adds a rich sesame taste to dressings/sauces but it also only uses 1-2 TSP per recipe. You can buy light or dark [dark will have a stronger flavor]. 2. 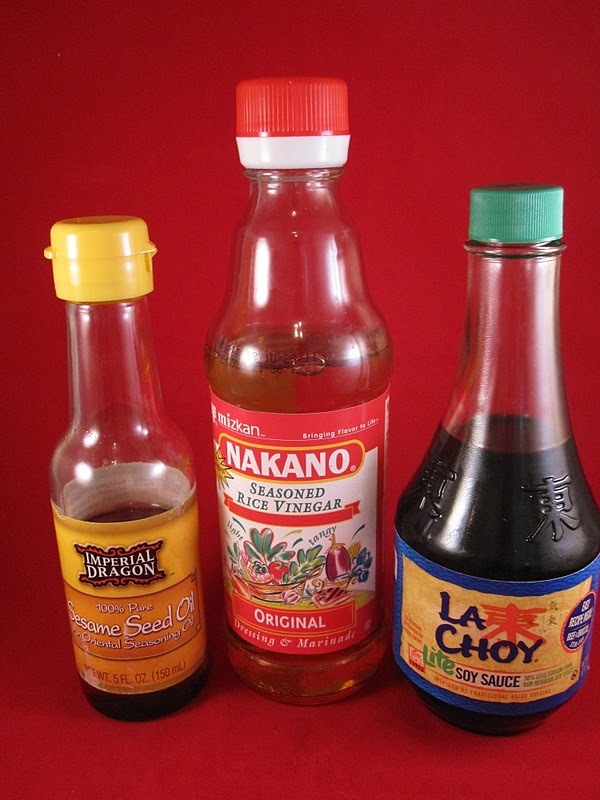 Soy Sauce-Most everyone probably has this on hand and the only recommendation I would make is to always buy low sodium. You will never notice a difference and its a lot better for you. I usually buy La Choy or Kikkoman. 3. Seasoned Rice Vinegar- Often used for dressings and sauces, recipes only call for 1-2 TBS usually. 1 bottle will last you a year. 4. Sesame seeds- These are untoasted and I toast mine for a few minutes in the oven before using. You can also buy toasted sesame seeds for a higher price. 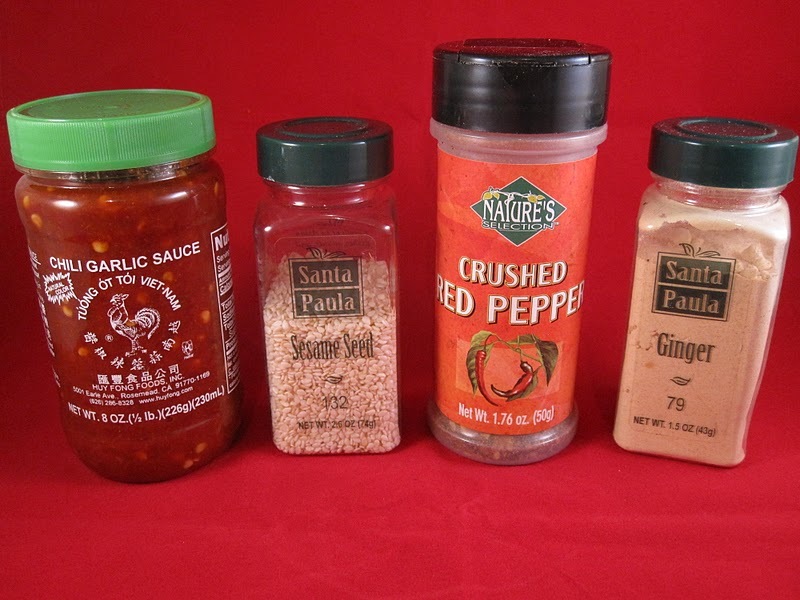 These are used in dressings, sesame chicken etc. 5. Chili garlic sauce-This adds heat and flavor to a lot of Asian dishes. Again, usually just a few teaspoons is enough for most meat dishes to get your tongue sizzling. 6. Cilantro- A must have for me normally but also a key ingredient in Thai cooking. 7. Crushed red pepper-Another way to add heat, I recommend having this on hand for other recipes anyways so this should be an easy one! 8. Powdered and/or fresh ginger- Adds a little zing to many dishes. Powdered is a lot more convenient but the flavor is a lot less powerful, fresh and rich. I recommend having both on hand. Fresh ginger is purchased in the produce section by other roots like carrots or sometimes in the unrefrigerated produce section. It is expensive per pound but you only need one small "branch" of it. Keep it in your freezer and it will last for months. 9. Minced Garlic- This big jar is my best friend. Perfect for all cooking its fast, easy, and flavorful. 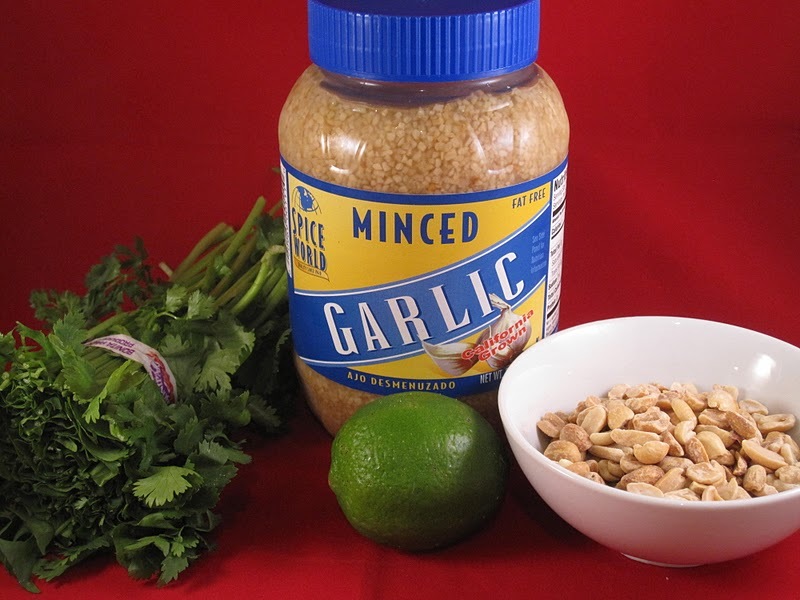 Fresh garlic is great but since this sits in liquid the garlic flavor is actually stronger. Not to mention its much faster and greater for larger batches of food. 10. Limes and Lemons- Limes are also common in Thai cooking and lemons are more East Asian I feel. Cheap and easy to just always have on hand. I guess you could keep bottled but often recipes call for the grated rind for extra flavor so I would try to keep fresh if possible. 11. Peanuts/Cashews- Peanuts show up in Thai cooking a lot and peanuts or cashews are great for Chinese recipes as well. I buy mine in the bulk food section. There you have it! I try to always have these on hand so I am ready for any Asian recipe! Also many recipes use brown sugar and cornstarch but I figure most of you have those on hand!